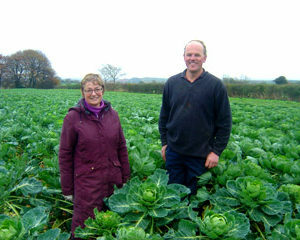 Newfields Organics is now run by Rosemary Wass since the death of her husband and partner Howard in 2007. The farm lies high on the southern edge of the North York Moors in the North of England. At an altitude of 650ft above sea level, this must be one of the highest organic farms in the country. About half the land is sandy loam over yellow sand & limestone; the rest is black peaty soil over sandstone. The sowing of seeds takes place in spring, with planting in May & June, and harvesting running right through from August to April. 60 acres of the land is dedicated to wheat, oats and spring barley, about 12 acres for livestock feeding, 20 acres for potatoes and 19 acres for their fine vegetables. The Wass family were early pioneers in organic growing. In 1986, Howard, Rosemary and their teenage children planted and watered in the first 30,000 leeks by hand and by 1990, the whole farm was fully organic. In 2004 Howard and Rosemary were recognised as National Organic Grower of the Year in the Marks & Spencer sponsored awards. To his great delight, Howard had confounded the view of a Ministry of Agriculture adviser that “he must be off his trolley” to be contemplating growing vegetables on this marginal land. For the Wasses, organic growing has always been an application of their faith, and their belief in social and environmental justice.